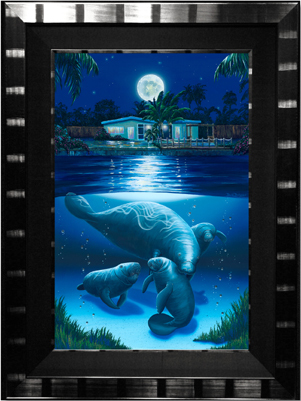 "River's Edge" features four manatees in a moonlit underwater scene. David Dunleavy giclées are printed on canvas and available in three sizes, at a limited edition run of 250 each. Proof SN. Size Framed 28" x 42" Gallery Wrapped 28" x 42" Unframed 28" x 42" Framed 20" x 30" Gallery Wrapped 20" x 30" Unframed 20" x 30" Framed 15" x 22.5" Gallery Wrapped 15" x 22.5" Unframed 15" x 22.5"